Not only are gas fireplaces a beautiful alternative to traditional wood-burning fireplaces, they are also easy to turn on and off and are more energy efficient. You don't need to store wood for a gas fireplace or clean ashes out of a gas fireplace. 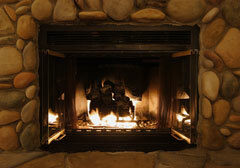 Besides, many gas fireplaces are equipped with a thermostat that is designed to maintain a specific room temperature. Gas fireplaces use natural or propane gas to simulate a real wood-burning fireplace. 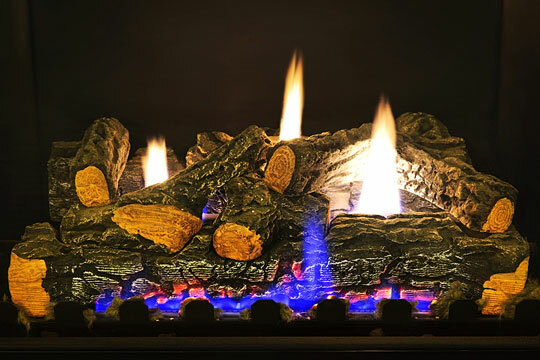 Gas fireplaces are equipped with special gas logs that look like real wood, and some come with glowing embers for an even more realistic look. An attractive gas fireplace is designed so that the gas pipes are hidden from view, and features tall gas flames in a random pattern, similar to a wood-burning fire. There are several different kinds of gas fireplaces on the market. Direct vent gas fireplaces are the most economical and the easiest to install, as they don't require a chimney or flue. Because they are designed so that a horizontal pipe exits a wall, they can be installed just about anywhere, including under windows. Because these fireplaces are completely sealed off and draw their air from the outside, they are extremely energy efficient. Masonry or wood surrounds designed for direct vent fireplaces make them look similar to traditional wood-burning fireplaces. B-vent fireplaces and top-vent fireplaces are not sealed. Because they use indoor air for combustion, they are less efficient than their direct vent counterparts. Movable glass on hinges or wire mesh screens allow one to access the gas fire. Neither vent-free fireplaces nor room-vented fireplaces require venting or air ducts for operation. This allows them to be placed just about anywhere. While the burners are designed to reduce carbon monoxide, vent-free or room-vented gas fireplaces have been banned in several states. While they do meet federal emissions and safety standards, if these stoves are used in small rooms or airtight locations they can reduce the oxygen to unsafe levels. For that reason, most of these fireplaces come with an oxygen-depletion detector, which turns the stove off if the surrounding oxygen level falls below safe levels. Gas fireplace inserts are designed to make traditional fireplaces throw more heat using less energy, and burn gas instead of wood. The inserts fit neatly inside an existing fireplace, and must be connected to an existing chimney with a sealed collar. A chimney liner to resize the flue is sometimes also needed. Gas log inserts are a good alternative if you want your old fireplace to be more convenient and less labor intensive to use, but don't want to spend a lot of time and money on remodeling. Gas log inserts basically comprise a set of gas logs and a gas line run to your existing masonry fireplace. Gas logs produce a clean burn and there is no wood to haul or ashes to clean up. They are also easy to operate, as starting your fire is as easy as pushing a button. Gas logs are the least energy-efficient gas fireplace models to operate, and because they are not sealed can affect indoor air quality. Central Fireplace - efficient direct-vent gas fireplaces. Hampton Fireplaces - controllable heat in cast iron surrounds. Heatilator - gas fireplace inserts and gas logs. Heat&Glo - features efficient, direct-vent gas fireplaces. 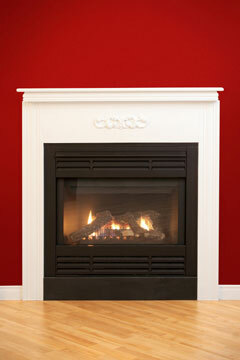 Mendota Hearth - offers gas fireplaces and gas fireplace inserts. Monessen Hearth - vented and vent-free fireplaces and inserts. Montigo - single-sided, multi-sided, and custom gas fireplaces. Napoleon Gas Fireplaces - full line of gas fireplaces and inserts. Quadra-Fire - gas fireplaces, stoves, and inserts. Regency Fire - offers stylish gas fireplaces and fireplace mantels. Valor Fireplaces - features efficient, radiant gas fireplaces. 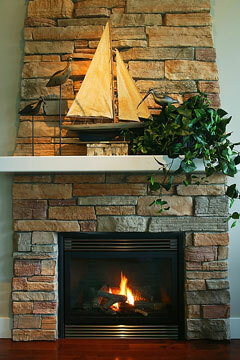 Vermont Castings - direct vent gas fireplace designs. Wittus - contemporary, European-style fireplaces and stoves.